Since 2010, $85 billion worth of petrochemical projects have been completed or started construction, with about a further $100 billion proposed, according to the American Chemistry Council. While some projects were postponed when oil prices crashed in 2014-2015, recent higher oil prices and stability and evidence of long-term demand is spurring a new wave of construction project announcements. Ethylene is a key raw material for the plastics industry which tends to grow at the same pace as US Gross Domestic Product (GDP). LyondellBasell has said in recent earnings calls that global demand grows at a pace where the world would still need about four to five new crackers every year to meet demand growth. Four crackers totaling more than 5 million tonnes/year of ethylene capacity are slated to start operations this year along the U.S. Gulf Coast. These are the first in a wave of shale-driven projects. Some 10.3 million tonnes of ethylene capacity will enter the U.S. market before the end of 2019. 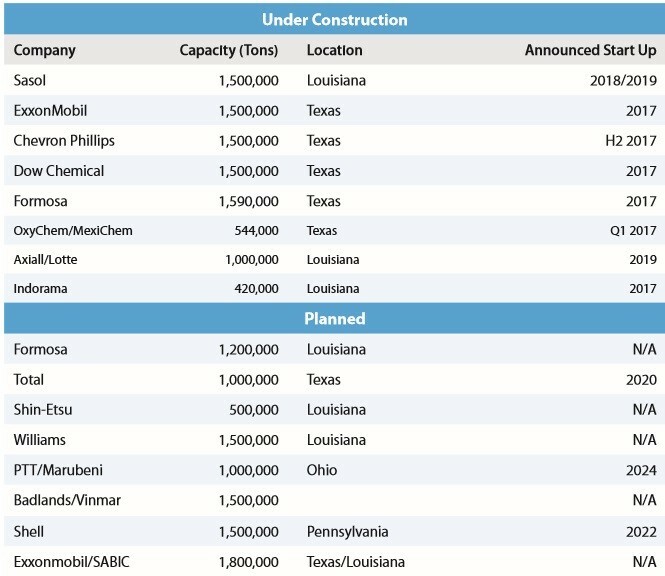 These new facilities will use ethane produced from U.S. shale as feedstock, totaling approximately 675,000 barrels/day, otherwise known as a 60% growth in ethane demand, according to NGL supplier Enterprise. LyondellBasell made it clear in its first quarter earning call that the outlook for NGL supply is positive for future investment decisions. “U.S. 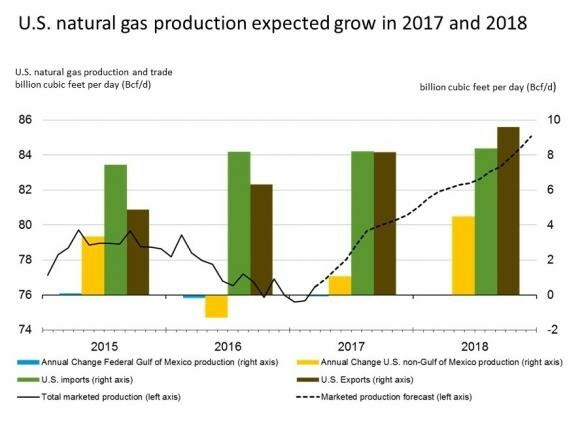 demand for natural gas is growing on the Gulf Coast due to the commissioning of LNG export facilities, stronger industrial demand, and the increases in pipeline exports to Mexico. This 20% increase in gas demand will bring more ethane and other NGLs to market. In addition, the ethane content of the gas is increasing with more production from NGL-rich basins,” LyondellBasell CEO Bob Patel said during first quarter earnings calls. “As a consumer of ethane, we're always cognizant of the logistics and transportation costs associated with this supply. 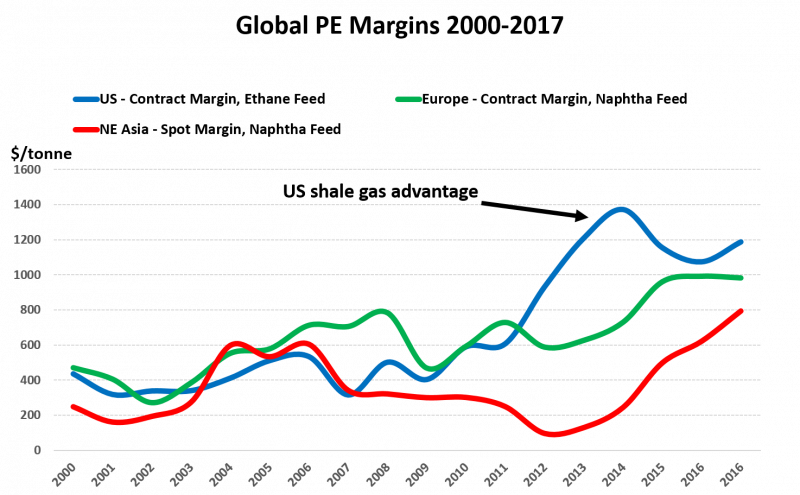 Fortunately, most of the recent activity has been focused in the Permian, Woodford and Eagle Ford Basins, which all have good connectivity to the Gulf Coast ethylene cracker market,” Patel continued. U.S. natural gas production is expected to grow in 2017 and 2018, with natural gas exports exceeding imports in 2018, according to the U.S. Energy Information Administration (EIA) Short Term Energy Outlook published in April. NGL suppliers such as Enterprise have made proactive efforts to prepare for the ongoing and upcoming construction waves. “The U.S. energy industry is finally entering the much awaited multi-year period of growing demand, both domestically and abroad, for U.S. NGLs, natural gas and crude oil,” Enterprise CEO Jim Teague said during its first quarter earnings calls. Because of strong demand, Enterprise recently accelerated the construction of the Midland-to-Sealy crude oil pipeline and its ninth NGL fractionator at Mont Belvieu. The company also sanctioned its Shin Oak NGL pipeline to transport growing volumes of NGLs from the Permian Basin to its Mont Belvieu, Texas complex. Enterprise is also in the process of completing construction and beginning commissioning activities at its own largest growth project, the propane dehydrogenation (PDH) plant at Mont Belvieu, Texas. “We now have a total of $8.4 billion of growth projects under construction scheduled to be completed this year through 2020,” Teague said.